Clock suppliers to over 70 different countries worldwide. Visit Grayson Clocks website to view our extensive range of clocks. Goldsmiths, Silversmiths, Watch & Clock Repairers, Horologists, Model Makers, Antique Restorers, Orthodontists, Nail Technicians, Stone Masons, Camera Repairers, Hairdressers, Artists, Woodworkers, Chemists, Theatrical Suppliers, Blacksmiths, Musicians, Locksmiths, Clockmakers and Engravers – pretty much anyone who works with their hands! for 1st Class UK Post. ** For free delivery the minimum spend is £50 plus VAT and it only applies to UK mainland delivery addresses. 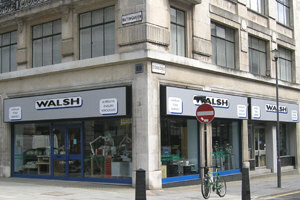 Welcome to the Walsh website where you will find more than 10,000 products from Abrasives to Zirconia. We have been the leading suppliers of tools and equipment for jewellers and horologists, jewellery findings, clock and watch materials to the jewellery and horological trades for more than 60 years and are the largest in the UK. We now export to more than 64 countries worldwide!